Johnny Depp works on no one’s clock but his own. 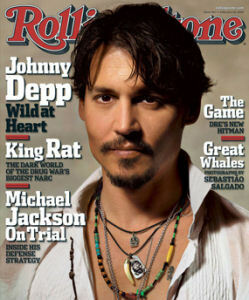 Albert Watson shot Depp for the [Feb. 10, 2005] cover in Los Angeles, after he received an Oscar nomination for Best Actor for his role in Finding Neverland. He didn’t want a hairstylist or a makeup artist. Depp walked in the studio, chose a shirt and was ready to go. “He’s devilishly good looking,” says Watson. “He just comes in. He’s himself. He had a cowboy hat on, and he’s easygoing. It didn’t matter what he was wearing. “A Good, Strong Cover has some sort of intrinsic weight and power,” says Watson. “You’re dealing with people who are at the height of their celebrity. 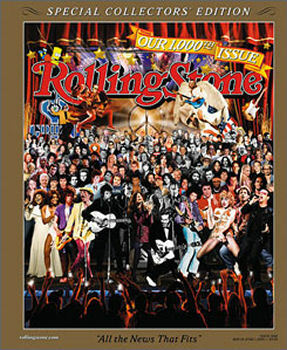 I think that’s an important thing.” Born in Edinburgh, Scotland, the photographer has shot thirty-nine covers in three decades for ROLLING STONE, from a snow-covered Jack Nicholson in 1981 to an earnest Jay-Z in 2005, both of which are among the six Watson covers that appear in this issue.